Here, we present a protocol for the isolation of healthy and functional primary mouse hepatocytes. Instructions for detecting hepatic nascent protein synthesis by non-radioactive labeling substrate were provided to help understand the mechanisms underlying protein synthesis in the context of energy-metabolism homeostasis in the liver. Salem, E. S., Murakami, K., Takahashi, T., Bernhard, E., Borra, V., Bethi, M., Nakamura, T. Isolation of Primary Mouse Hepatocytes for Nascent Protein Synthesis Analysis by Non-radioactive L-azidohomoalanine Labeling Method. J. Vis. Exp. (140), e58323, doi:10.3791/58323 (2018). Hepatocytes are parenchymal cells of the liver and engage multiple metabolic functions, including synthesis and secretion of proteins essential for systemic energy homeostasis. Primary hepatocytes isolated from the murine liver constitute a valuable biological tool to understand the functional properties or alterations occurring in the liver. Herein we describe a method for the isolation and culture of primary mouse hepatocytes by performing a two-step collagenase perfusion technique and discuss their utilization for investigating protein metabolism. The liver of an adult mouse is sequentially perfused with ethylene glycol-bis tetraacetic acid (EGTA) and collagenase, followed by the isolation of hepatocytes with the density gradient buffer. These isolated hepatocytes are viable on culture plates and maintain the majority of endowed characteristics of hepatocytes. These hepatocytes can be used for assessments of protein metabolism including nascent protein synthesis with non-radioactive reagents. We show that the isolated hepatocytes are readily controlled and comprise a higher quality and volume stability of protein synthesis linked to energy metabolism by utilizing the chemo-selective ligation reaction with a Tetramethylrhodamine (TAMRA) protein detection method and western blotting analyses. Therefore, this method is valuable for investigating hepatic nascent protein synthesis linked to energy homeostasis. The following protocol outlines the materials and methods for the isolation of high-quality primary mouse hepatocytes and detection of nascent protein synthesis. Protein is an important nutritional element and approximately 50% of the dry weight of a human body is composed of proteins which have several biological traits and functions1. Consequently, protein synthesis is one of the most energy consuming events and an alteration in protein metabolism is highly associated with the development of diseases, including metabolic diseases2,3,4. In the liver, protein biosynthesis accounts for approximately 20–30% of total energy consumption5,6. In addition, proteins function as not only passive or building blocks of the liver, but also active signal-mediating factors intracellularly or extracellularly to regulate the systemic metabolism7. For instance, reduced levels of serum albumin, which is synthesized and secreted by the liver and the most abundant protein in the plasma8, increases the risk of type 2 diabetes development9,10,11, whereas a higher concentration of serum albumin is protective against developing metabolic syndrome12. Furthermore, disturbed or disruption of secretory or membrane-bound hepatic proteins, which modulate cholesterol homeostasis, including lipoproteins, LDLR, and LRP1, can lead to the development of insulin resistance, hyperlipidemia, or atherosclerosis13. Therefore, the identification of molecular pathophysiological mechanisms that are involved in protein metabolism disturbance in the liver and its associated metabolic complications might be useful for discovering novel pharmacological approaches to retard onset or treat metabolic diseases such as insulin resistance, diabetes, and non-alcoholic fatty liver. Protein synthesis is tightly linked to the cellular energy status (e.g., the formation of one peptide bond during the elongation step of protein synthesis requires 4 phosphodiester bonds14) and is regulated by molecular pathways that sense inter- and intra-cellular nutrient availability15,16. AMP-activated protein kinase (AMPK) is one of the intracellular energy sensors that maintain energy homeostasis17. Once AMPK is activated when cellular energy levels become lower, AMPK and its targeted substrates function to stimulate catabolic pathways and inhibit anabolic processes including protein synthesis18,19. The regulation of protein synthesis is mediated by phosphorylation of multiple translation factors and ribosomal proteins20. Of note, the mammalian target of rapamycin complex 1 (mTORC1), a major driver of protein synthesis, is one of the main targets of AMPK21. Activation of the mTORC1 pathway enhances the cell growth and proliferation by stimulating protein translation and autophagy20,21. Therefore, it is logical that activation of AMPK can inhibit mTORC1-mediated protein synthesis22. Indeed, activation of AMPK counteracts and directly phosphorylates mTORC1 on threonine residue 2446 (Thr2446) leading to its inactivation23 and suppression of protein biosynthesis24. Moreover, AMPK can indirectly inhibit mTORC1 function by phosphorylation and activation of tuberous sclerosis complex 2 (TSC2)25 which is the upstream regulator of mTORC1 signaling cascade. In short, dysregulation of these pathways in the liver is often linked to the development of metabolic diseases and therefore there is a critical need to establish effective experimental tools to investigate the role of these pathways in the regulation of energy and protein metabolism in hepatocytes. There is a stronger similarity between the functional properties of isolated primary hepatocytes and in vivo hepatocytes than with in vitro liver-derived cell lines26,27,28. It has been shown that primary human hepatocytes share 77% similarity with that of liver biopsies, whereas HepG2 cells, which are well-differentiated hepatic cancerous cells and widely used to investigate hepatic functions, display less than 48% in the context of gene expression profiles29. Therefore, utilization of primary hepatocytes, rather than immortalized culture cells, is of vital importance in investigating hepatic function and physiology, and several protocols are available for the isolation and culture of primary hepatocytes especially from rats30,31. While the rat hepatocytes are useful with a relatively higher yield of cells, mouse hepatocytes have a greater potential in many scientific aspects because of the wide availability of genetically modulated mice. However, there are several technical challenges in isolating healthy and abundant primary hepatocytes from mice for cellular- and molecular-based assessments: first, cannula insertion to perfuse the liver with buffer reagents is very difficult to handle because of the small and thin mouse portal vein or inferior vena cava; second, a longer manipulation time of cells during the isolation can cause reduction in cell quantity and quality; third, non-enzymatic mechanical separation methods can result in severe damage and produce a low yield of viable isolated primary hepatocytes32,33. In the 1980s, collagenase perfusion technique was introduced for isolating hepatocytes from the livers of animals34. This method is based on collagenase perfusion of the liver35,36,37, infusion of the liver with calcium chelator solution38,39, enzymatic digestion and mechanical dissociation of the hepatic parenchyma35. In the first step, a mouse liver is perfused with a calcium [Ca2+] free buffer containing a [Ca2+] chelator (ethylenediamine tetraacetic acid, EDTA). 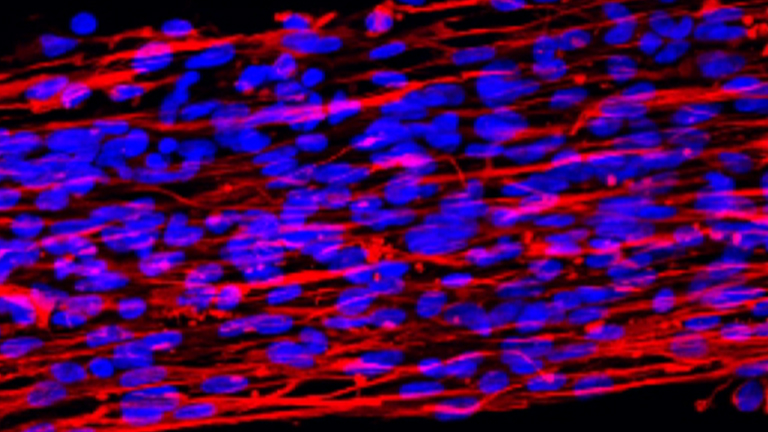 In the second step, the mouse liver is perfused with a collagenase-containing buffer to hydrolyze the cellular-extracellular matrix interactions. Unlike the buffer used in step one, the presence of [Ca2+] ions in the buffer of the second step is required for effective collagenase activity, after which the digested liver has to be further gently and mechanically separated using forceps between the hepatic capsule and parenchymatous tissue. Finally, connective tissue is removed by filtering, and subsequent centrifugation separates viable hepatocytes from both non-parenchymal cells and non-living hepatocyte with the use of density gradient buffer40,41,42. In the present study, we show a modified two-step collagenase perfusion technique to isolate primary hepatocytes from a mouse liver for the analysis of protein synthesis. The radiolabeling of proteins is widely used to quantify the expression levels, turnover rates, and determine the biological distribution of proteins43 due to the high sensitivity of detection of radioactivity44. However, the use of radioactive isotopes requires highly controlled research circumstances and procedures45. Alternative non-radioactive methods have been developed and have increasingly gained in popularity. The chemo-selective ligation reaction with a Tetramethylrhodamine (TAMRA) protein detection method is one of them and is based on the chemo-selective reaction between an azide and alkyne groups46, which can be utilized to analyze cellular events such as detecting nascent protein synthesis and subclasses of glycoproteins modified with an azide group. For nascent protein synthesis, L-Azidohomoalanine (L-AHA, an azide-modified amino acid) can be metabolically incorporated into proteins and detected by using the TAMRA protein detection method47. By using this assay in primary mouse hepatocytes, we show that the nascent protein synthesis rate is tightly linked to the availability of ATP from mitochondrial and AMPK activation (Figure 1). In summary, utilization of primary mouse hepatocytes is crucial to investigating the protein and energy metabolism and quantifying nascent protein synthesis is valuable for gaining insights into the physiological role of pathways relevant to the development and cure of hepatocyte-related diseases. This protocol contains the use of laboratory mice. Animal care and experimental procedures were performed according to procedures approved by the animal care committees of Cincinnati Children Hospital Medical Center. Prepare 450 mL of 40% density gradient buffer as described in Table 1 and keep at 4 °C (15 mL/mouse). Prepare 500 mL of Williams’ Medium as described in Table 1 and keep at 4 °C. Prepare 500 mL of DMEM as described in Table 1 and keep on ice (30 mL/mouse). Prepare 500 mL of HBSS (-) Buffer as described in Table 1 and keep at 42 °C in the water bath (40 mL/mouse). Prepare 500 mL of HBSS (+) Buffer with 0.3 mg/mL Collagenase Type X as described in Table 1 with 30 min incubation at 42 °C in the water bath (40 mL/mouse). Set up the perfusion pump by placing the intravenous (I.V) administration tubing across the latching foot pedal and by checking the flow of flushing solution without air bubbles. Warm up the tube heater at 42 °C. Cool down the centrifuge machine to 4 °C. Clean the work areas and the pump. Rinse out the pump-connected IV tube by running 70% ethanol thoroughly for 10 min. Remove the residual ethanol from the pump-connected IV tube by rinsing with DDW entirely for 10 min. Wipe the scissors and forceps with 70% ethanol. Place the mouse in a plastic container with a mesh bottom and with the 2 mL isoflurane-soaked gauze underneath the mesh to avoid the direct contact. Asses the depth of anesthesia by pedal reflex (firm toe pinch). Remove the mouse when it has reached the desired depth of anesthesia. NOTE: The induction time of anesthesia should not be more than 1 min. Construct a nose cone using a 15 mL conical tube with 1 mL isoflurane-soaked pad pushed to the end of the tube. Control the depth of anesthesia by moving the nose cone closer or away from the mouse nostrils. Place the mouse on the working platform with the ventral side facing up. Spray 70% ethanol over the abdominal area of the mouse and then open the abdominal cavity by making a large transverse incision of the dermis and peritoneum by using sharp scissors and toothed forceps. Then, make a vertical cut of the abdominal layers until all abdominal organs are completely exposed by using sharp scissors and toothed forceps. Move small and large intestines toward the left side of the mouse with autoclaved cotton tip until liver, portal vein, and inferior vena cava (IVC) are clearly exposed. Insert a 24 G catheter into IVC just at the bifurcation with right renal vein carefully without shaking hands to avoid the injury of IVC and bleeding. NOTE: If bleeding occurs while you are inserting the catheter into IVC, then you should try to insert the new catheter into a portal vein. Remove the needle of the catheter and control the position of the cannula to avoid getting out of IVC, then connect 24 G cannula with perfusion tube by using the connector. NOTE: Avoid the presence of air bubbles before starting the perfusion. Start the perfusion of the liver with warm HBSS (-) at a flow rate of 4 mL/min and cut off the splenic vein quickly to drain out the internal blood by using scissors. NOTE: If the cannulation is successful, the liver will begin to blanch due to the backflow distribution of the buffer from IVC to hepatic veins. The portal vein is formed by the union of splenic and superior mesenteric veins; therefore, it is quite safe to cut the splenic vein since it is big and distal from the liver. Continue perfusion with 35 mL of warm HBSS (-). NOTE: The liver will become pale in color if the perfusion is adequate, and the mouse still alive under anesthesia at this stage. Perfuse the mouse liver with warm 35 mL of HBSS (+) including Collagenase Type X at a flow rate of 4 mL/min. Every few minutes, clamp the splenic vein by using forceps for ~10 s to allow the entire volume of HBSS (+) to diffuse into all anatomical parts of the liver. NOTE: Liver begins to swell after clamping the splenic vein due to buffer congestion. Pour 5 mL of prepared warm HBSS (+) with Collagenase Type X into 100 mm Petri dish at the end of the perfusion process. Cut off the perfused liver from the rest of the body before stopping the pump to avoid the backflow of blood into the liver, remove the gallbladder by forceps, and then wipe the liver gently with a paper towel to remove the blood. Transfer the liver to the Petri dish which contains 5 mL of prepared warm HBSS (+) and remove the liver capsule gently using straight-tipped forceps. NOTE: The liver capsule is a thin layer of connective tissue that surrounding the liver. Disperse the parenchymal tissue carefully by using the forceps. Add 15 mL cold DMEM to the Petri dish. NOTE: The medium will turn cloudy due to parenchymal cells if the liver is well digested. Shake the torn liver gently to release the residual parenchymal cells into the medium and add another 15 mL cold DMEM to the Petri dish to get the rest of the cells. Transfer DMEM with the dissolved liver through 100 μm cell strainer into a 50 mL conical tube and keep in ice. Centrifuge the cell suspension at 60 x g for 2 min at 4 °C, carefully remove the supernatant by vacuum aspiration and resuspend the pellet in 10 mL DMEM. Add resuspended pellet as a thin layer on the top of 40% density gradient buffer, and centrifuge at 800 x g for 10 min without brake at 4 °C. Carefully remove supernatant including the upper layer (DMEM) and the middle layer (dead or non-parenchymal cells), but not the lower layer (Pellet: primary parenchymal hepatocytes). Resuspend the primary cells with 2–3 mL William’s medium E, and transfer to the new 50 mL tube to avoid contamination of dead cells on the wall of the tube. Add 7-8 mL William’s medium E, mix gently, and centrifuge at 800 x g for 1 min at 4 °C. Carefully remove supernatant by vacuum aspiration and then resuspend pellet again with 10, 20 or 30 mL of William’s medium E (according to the size of the pellet). Count the cells by using an automated cell counter. Seed with William’s medium E, keep the plate in an incubator at 37 °C for 2-3 h, then replace the medium with10% FBS DMEM medium with Anti-Anti to remove the dead or unattached cells and for overnight incubation at 37 °C. Next day, primary mouse hepatocytes are ready for experimental use. (Pre-treatment) Wash primary hepatocytes with 37 °C warm PBS twice and add the methionine-free DMEM medium for 30 min to deplete the cytoplasmic methionine reserves. NOTE: L-Azidohomoalanine, is an amino acid and analog to methionine, contains an azido moiety that can be incorporated into proteins during biosynthesis of cellular proteins so that depletion of cytoplasmic methionine will enhance the feeding and incorporation of L-Azidohomoalanine into newly synthesized proteins of cultured primary hepatocytes. (Treatment) Wash primary hepatocytes with 37 °C warm PBS twice and add the methionine-free DMEM medium with 25 μM AHA (L-Azidohomoalanine) for 4–6 h.
Add any specific chemical (i.e. 10 μM rotenone) in the medium for 4–6 h in presence of AHA in order to investigate its effect on nascent protein expression levels. After incubation, remove the medium by vacuum aspiration and wash primary hepatocytes with cold PBS three times. Add 200 μL lysis buffer to the plate and incubate for 15-30 min on ice, then tilt the plate and take the whole cell lysate into 1.7 mL tube. NOTE: You should observe that cell lysate is very sticky during the cell harvesting. Sonicate the cell lysate on ice for 5 s three times by using a probe sonicator to solubilize the proteins and disperse the DNA. Vortex the cell lysate for 5 min, centrifuge the cell lysate at 21,130 x g for 10 min at 4 oC and then transfer the clear supernatant into a new tube. Measure the protein concentration twice. NOTE: At this stage, protein samples can be stored at -20 °C for two weeks if they are not immediately used. Prepare the components (A+B) by adding 60 μL of component (A) to component (B). NOTE: The solution turns to bright pink in color after adding component (A) to (B). Prepare the buffers (D) and (E) according to the protocol. Take 20–40 μg cell lysate and add 50 μL 2x reaction buffer (component A+B), then adjust the volume to 80 μL by adding DDW and vortex for 5 s.
Add 5 μL CuSO4 (component C), and vortex for 5 s.
Add 5 μL reaction buffer additive 1 (freshly prepared component D), then vortex for 5 s and wait for 3 min. Add 10 μL reconstituted reaction buffer additive 2 (component E), then vortex for 5 s and rotate samples for 20 min at 4 °C by using a multi-rotator machine. NOTE: The solution turns to bright orange in color after adding component (E). The samples should be protected from light during the rotation. Add 300 μL methanol and vortex for 5 s, add 75 μL chloroform and vortex for 5 s, then add 200 μL DDW and vortex for 5 s.
Centrifuge the samples at 21,130 x g and 4 °C for 5 min, then discard the aqueous supernatant and keep the pellet. Add 250 μL methanol to the tube, vortex, and spin again for 5 min at 21,130 x g.
Discard the supernatant, then cover the samples with the lint-free tissue and allow the pellets to air-dry for 15 min at room temperature. Solubilize the pellet in 20 μL of loading buffer without β-mercaptoethanol, vortex for 10 min, heat at 70 °C by using heat block for 10 min. Then load the samples into 10% SDS gel (1.5 mm) for Tetramethylrhodamine (TAMRA) detection. Detect AHA signal using a variable mode laser scanner for precise quantitation of nascent proteins. Wash the Gel with DDW for 15 min. Then, stain the 10% SDS gel with a fast and sensitive coomassie-dye reagent for 15–60 min to detect total proteins as a control. De-stain the Gel with DDW for 1–2 h and acquire the image by using a UV fluorescence imager. Primary mouse hepatocytes isolation results in a yield of approximately 20 x 106 total cells/mouse. Histologically, live and attached primary hepatocytes appear polygonal or typical hexagonal in shape with clearly outlined membranous boundary after 24 h incubation (Figure 2). To confirm whether isolated cells are primary hepatocytes, we compared expression levels of albumin protein in isolated primary mouse hepatocytes (PMHs), mouse embryonic fibroblasts (MEFs), a mouse hepatoma cell line (Hepa 1-6), and mouse livers. The albumin protein expression was detected in primary mouse hepatocytes and mouse livers but was not detectable in either MEFs or Hepa 1-6 cells (Figure 3). To determine whether the effects of rotenone on hepatic AMP-activated protein kinase (AMPK) activation is cell-autonomous, we compared the time-dependent response of primary hepatocytes isolated from a liver of wild-type mouse. Primary hepatocytes were treated without or with 10 μM rotenone for 0, 4 or 6 h. In these cells, rotenone treatment robustly induced AMPK activation, as detected by increased phosphorylation levels on AMPK-T172 similar to those seen in vivo48 (Figure 4). To directly measure the effects of rotenone treatment on nascent protein synthesis in primary hepatocytes, the incorporation of non-radioactive AHA into protein over 5 h was assessed by performing the chemo-selective ligation reaction assay. Treatment with 10 μM rotenone for 5 h had profound inhibitory effects on nascent protein synthesis in treated primary hepatocytes when compared to untreated primary hepatocytes (Figure 5). 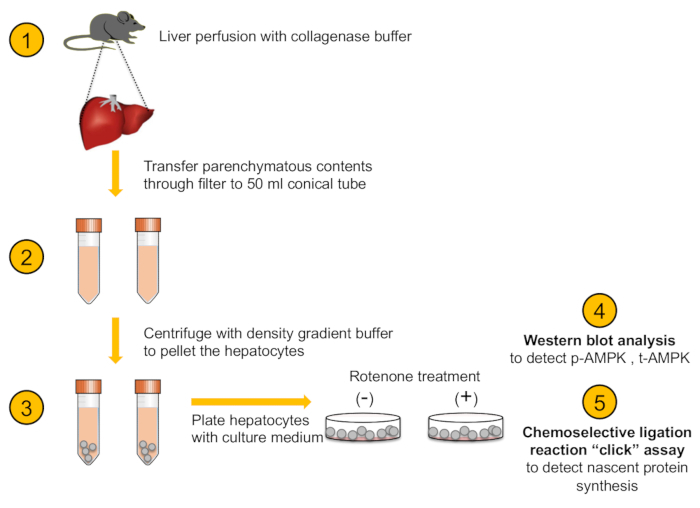 Figure 1: An illustration shows the steps of primary mouse hepatocytes isolation, western blot analysis, and chemo-selective ligation reaction procedures. Figure 2: Phase contrast morphological images of primary mouse hepatocytes. Representative pictures of isolated primary hepatocytes were acquired at 2, 12, 24, and 72 h after plating. Scale bars = 100 μm. Figure 3: Western blot analysis for albumin protein expression in primary mouse hepatocytes. Western blot analysis was conducted with the loading of 10 μg protein/lane from primary mouse hepatocytes (PMHs), mouse embryonic fibroblasts (MEFs), Hepa 1-6 cells, and mouse livers. One-way ANOVA showed a significant albumin protein expression in PMHs compared to MEF or Hepa 1-6 cells. Values are means ± SEM of group size (n = 3). *P, #P <0.001 vs. Hepa 1-6 or MEFs, respectively. $P <0.001 vs. liver lysate. Figure 4: Induction of phosphorylation of AMPK in rotenone-treated primary mouse hepatocytes. Primary hepatocytes from a wild-type mouse liver were treated with 10 μM rotenone for 0, 4 or 6 h. Phosphorylation levels of AMPK were detected by western blotting and β-actin was used as a loading control (10 μg protein was loaded/lane). Repeated measurements 2-way ANOVA showed that treatment caused a significant increase in protein expression of phospho-AMPK in comparison to untreated primary hepatocytes. Values are means ± SEM of group size (n = 3). *P <0.001 vs. Untreated hepatocytes. Figure 5: Reduction of hepatic nascent protein expression after rotenone treatment. Primary hepatocytes from a wild-type mouse liver were treated with 10 μM rotenone for 5 h, followed by a nascent protein synthesis assay with non-radioactive AHA method. Protein synthesis levels were assessed by a laser scanner detecting the TAMRA fluorescence. Total protein loading levels for this assay were detected by the coomassie-dye reagent. Although several immortalized hepatic cell lines have been proposed and used to investigate liver functions49,50,51,52, these cells generally lack the important and fundamental functions of normal hepatocytes, such as the expression of albumin (Figure 3). It is widely recognized, therefore, that utilizing primary hepatocytes is a valuable option for examining liver physiology and metabolism in culture, despite the challenges of culturing and maintaining of these cells. Herein, our study details the successful isolation of primary mouse hepatocytes by conducting a two-step collagenase method in a relatively convenient and efficient manner. Through these procedures, the majority of isolated primary hepatocytes within the culture retain their metabolic functionality and morphological stability and can be used for investigating hepatic functions including protein metabolism, gluconeogenesis, and mitochondrial respiration. Isolated primary hepatocytes are a powerful experimental tool to examine molecular mechanisms of hepatic energy metabolism. Rotenone interferes with the electron transport chain complex I activity in mitochondria and blocks oxidative phosphorylation with the limited synthesis of ATP53, as evidenced by the activation of AMPK (Figure 4). The AMPK activation triggers the cellular adaptive responses that suppress the anabolic mechanism to compensate the rotenone-induced energy-deficient stress. Under this condition, we successfully detected the drastic reduction of nascent protein synthesis levels in primary hepatocytes using a non-radioactive, chemo-selective ligation reaction with a TAMRA protein detection method (Figure 5). These results confirm the importance of energy supply from the mitochondria for appropriate protein synthesis in primary hepatocytes. These techniques are useful to provide the information regarding a drug action or toxicity within therapeutically relevant concentrations in the context of hepatic protein synthesis of healthy and diseased conditions. In addition, these techniques are applicable for examining the role of specific pathways modulating protein and energy metabolism by analyzing primary hepatocytes isolated from genetically manipulated mice. In general, low yield and cell viability are the major drawbacks of the use of primary hepatocytes. These issues are due to several reasons such as initial cannulation, insufficient washing with HBSS, inappropriate concentration of collagenase, or long-perfusion period. Our current protocol optimizes these multiple steps and leads to gaining a higher yield and viable cells around 20 million/liver/adult mice. Especially, there are two critical steps: one is to adjust the temperature and the flow rate of digested buffers with proper collagenase concentration to digest the hepatic parenchyma efficiently in 15–20 min from cannula insertion until liver excision, and another is to process these collagenases treated samples quickly as described in order to keep cells in healthy condition. While isolated hepatocytes-based studies have been conducted within 48 h time frame in many published data, primary hepatocytes isolated with our procedures endure the longer-term culture (Figure 2). With these cells, we show the robust labeling of hepatic nascent protein synthesis through the chemo-selective ligation reaction assay, although the concentration and incubation time with AHA in the protocol may have to be re-optimized in different biological conditions of cells (e.g. physiological vs. pathological, wild-type vs. transgenic or knockout/down cells). In summary, we have established procedures to analyze primary mouse hepatocytes for nascent protein synthesis in a non-radioactive manner. These cells respond well to mitochondrial stress and exhibit suppression of protein synthesis with activation of the AMPK pathway. Thus, these isolated hepatocytes are valuable models for investigating the pathophysiology of hepatic protein and energy metabolism ex vivo. The authors indicate they have no conflicts of interest. We thank Drs. Joonbae Seo and Vivian Hwa for their scientific input and discussion. This work was supported by National Institute of Health (NIH) (R01DK107530). T.N. was supported by the PRESTO from the Japan Science and Technology Agency. A part of this study was supported by a grant from NIH (P30DK078392) for the Digestive Disease Research Core Center in Cincinnati. Forbes, R. M., Cooper, A. R., Mitchell, H. H. The composition of the adult human body as determined by chemical analysis. Journal of Biological Chemistry. 203, 359-366 (1953). Charlton, M. R. Protein metabolism and liver disease. Baillieres Clinical Endocrinology and Metabolism. 10, 617-635 (1996). De, F. P., Lucidi, P. Liver protein synthesis in physiology and in disease states. Current Opinion in Clinical Nutrition and Metabolic Care. 5, 47-50 (2002). Stoll, B., Gerok, W., Lang, F., Haussinger, D. Liver cell volume and protein synthesis. Biochemical Journal. 287, (Pt 1), 217-222 (1992). Brown, G. C. Control of respiration and ATP synthesis in mammalian mitochondria and cells. Biochemical Journal. 284, (Pt 1), 1-13 (1992). Buttgereit, F., Brand, M. D. A hierarchy of ATP-consuming processes in mammalian cells. Biochemical Journal. 312, (Pt 1), 163-167 (1995). Morrison, C. D., Laeger, T. Protein-dependent regulation of feeding and metabolism. Trends in Endocrinology and Metabolism. 26, 256-262 (2015). Bernardi, M., Ricci, C. S., Zaccherini, G. Role of human albumin in the management of complications of liver cirrhosis. Journal of Clinical and Experimental Hepatology. 4, 302-311 (2014). Abbasi, A., et al. Liver function tests and risk prediction of incident type 2 diabetes: evaluation in two independent cohorts. PLoS. One. 7, e51496 (2012). Schmidt, M. I., et al. Markers of inflammation and prediction of diabetes mellitus in adults (Atherosclerosis Risk in Communities study): a cohort study. Lancet. 353, 1649-1652 (1999). Stranges, S., et al. Additional contribution of emerging risk factors to the prediction of the risk of type 2 diabetes: evidence from the Western New York Study. Obesity (Silver Spring). 16, 1370-1376 (2008). Jin, S. M., et al. Change in serum albumin concentration is inversely and independently associated with risk of incident metabolic syndrome. Metabolism. 65, 1629-1635 (2016). Sluis, B., Wijers, M., Herz, J. News on the molecular regulation and function of hepatic low-density lipoprotein receptor and LDLR-related protein 1. Current Opinion in Lipidology. 28, 241-247 (2017). Viollet, B., et al. Activation of AMP-activated protein kinase in the liver: a new strategy for the management of metabolic hepatic disorders. Journal of Physiology. 574, 41-53 (2006). Li, H., Lee, J., He, C., Zou, M. H., Xie, Z. Suppression of the mTORC1/STAT3/Notch1 pathway by activated AMPK prevents hepatic insulin resistance induced by excess amino acids. Amerian Journal of Physiology-Endocrinology and Metabolism. 306, E197-E209 (2014). Qian, S. B., et al. mTORC1 links protein quality and quantity control by sensing chaperone availability. The Journal of Biological Chemistry. 285, 27385-27395 (2010). Carling, D. The AMP-activated protein kinase cascade--a unifying system for energy control. Trends in Biochemical Sciences. 29, 18-24 (2004). Hardie, D. G., Scott, J. W., Pan, D. A., Hudson, E. R. Management of cellular energy by the AMP-activated protein kinase system. FEBS Letters. 546, 113-120 (2003). Li, H., et al. AMPK activation prevents excess nutrient-induced hepatic lipid accumulation by inhibiting mTORC1 signaling and endoplasmic reticulum stress response. Biochimica et Biophysica Acta. 1842, 1844-1854 (2014). Proud, C. G. Role of mTOR signalling in the control of translation initiation and elongation by nutrients. Current Topics in Microbiology and Immunology. 279, 215-244 (2004). Sarbassov, D. D., Ali, S. M., Sabatini, D. M. Growing roles for the mTOR pathway. Current Opinion in Cell Biology. 17, 596-603 (2005). Reiter, A. K., Bolster, D. R., Crozier, S. J., Kimball, S. R., Jefferson, L. S. Repression of protein synthesis and mTOR signaling in rat liver mediated by the AMPK activator aminoimidazole carboxamide ribonucleoside. American Journal of Physiology-Endocrinology and Metabolism. 288, E980-E988 (2005). Cheng, S. W., Fryer, L. G., Carling, D., Shepherd, P. R. Thr2446 is a novel mammalian target of rapamycin (mTOR) phosphorylation site regulated by nutrient status. Journal of Biological Chemistry. 279, 15719-15722 (2004). Howell, J. J., et al. Metformin Inhibits Hepatic mTORC1 Signaling via Dose-Dependent Mechanisms Involving AMPK and the TSC Complex. Cell Metabolism. 25, 463-471 (2017). Inoki, K., Zhu, T., Guan, K. L. TSC2 mediates cellular energy response to control cell growth and survival. Cell. 115, 577-590 (2003). Wilkening, S., Stahl, F., Bader, A. Comparison of primary human hepatocytes and hepatoma cell line Hepg2 with regard to their biotransformation properties. Drug Metabolism Disposition. 31, 1035-1042 (2003). Li, A. P., et al. Present status of the application of cryopreserved hepatocytes in the evaluation of xenobiotics: consensus of an international expert panel. Chemico-Biology Interactaction. 121, 117-123 (1999). Hengstler, J. G., et al. Cryopreserved primary hepatocytes as a constantly available in vitro model for the evaluation of human and animal drug metabolism and enzyme induction. Drug Metabolism and Reviews. 32, 81-118 (2000). Olsavsky, K. M., et al. Gene expression profiling and differentiation assessment in primary human hepatocyte cultures, established hepatoma cell lines, and human liver tissues. Toxicology and Applied Pharmacology. 222, 42-56 (2007). Shen, L., Hillebrand, A., Wang, D. Q., Liu, M. Isolation and primary culture of rat hepatic cells. Journal of Visualized Experiments. (2012). Li, Y., Cai, S., Zhang, L., Li, X. Simultaneous isolation and primary culture of rat hepatocytes, hepatic stellate cells, Kupffer's cells and hepatic sinus endothelial cells. Nan. Fang Yi. Ke. Da. Xue. Xue. Bao. 34, 532-537 (2014). Edwards, M., Houseman, L., Phillips, I. R., Shephard, E. A. Isolation of mouse hepatocytes. Methods in Molecular Biology. 987, 283-293 (2013). Schreiber, G., Schreiber, M. The preparation of single cell suspensions from liver and their use for the study of protein synthesis. Subcellular Biochemistry. 2, 307-353 (1973). Klaunig, J. E., Goldblatt, P. J., Hinton, D. E., Lipsky, M. M., Trump, B. F. Mouse liver cell culture. II. Primary culture. In Vitro. 17, 926-934 (1981). Puviani, A. C., Ottolenghi, C., Tassinari, B., Pazzi, P., Morsiani, E. An update on high-yield hepatocyte isolation methods and on the potential clinical use of isolated liver cells. Comparative Biochemistry and Physiology A Molecular and Integrative Physiology. 121, 99-109 (1998). Park, K. H., Song, S. C. Morphology of spheroidal hepatocytes within injectable, biodegradable, and thermosensitive poly(organophosphazene) hydrogel as cell delivery vehicle. Journal of Biosciences and Bioengineering. 101, 238-242 (2006). Li, K., et al. Improved performance of primary rat hepatocytes on blended natural polymers. Journal of Biomedicine and Material Research Part A. 75, 268-274 (2005). Battle, T., Stacey, G. Cell culture models for hepatotoxicology. Cell Biology Toxicology. 17, 287-299 (2001). Kravchenko, L., Petrenko, A., Shanina, I., Fuller, B. A simple non-enzymatic method for the isolation of high yields of functional rat hepatocytes. Cell Biology International. 26, 1003-1006 (2002). Berry, M. N., Grivell, A. R., Grivell, M. B., Phillips, J. W. Isolated hepatocytes--past, present and future. Cell Biology and Toxicology. 13, 223-233 (1997). Jiang, Q. D., et al. Isolation and identification of bovine primary hepatocytes. Genetics and Molecular Research. 12, 5186-5194 (2013). Pertoft, H., Laurent, T. C., Laas, T., Kagedal, L. Density gradients prepared from colloidal silica particles coated by polyvinylpyrrolidone (Percoll). Analytical Biochemistry. 88, 271-282 (1978). Lipford, G. B., Feng, Q., Wright, G. L. Jr A method for separating bound versus unbound label during radioiodination. Analytical Biochemistry. 187, 133-135 (1990). Mukai, T., et al. In-vivo evaluation of indium-111-diethylenetriaminepentaacetic acid-labelling for determining the sites and rates of protein catabolism in mice. Journal of Pharmacy and Pharmacology. 51, 15-20 (1999). Wilson, M. S. C., Saiardi, A. Importance of Radioactive Labelling to Elucidate Inositol Polyphosphate Signalling. Topics in Current Chemistry. 375, 14 (2017). Rostovtsev, V. V., Green, L. G., Fokin, V. V., Sharpless, K. B. A stepwise huisgen cycloaddition process: copper(I)-catalyzed regioselective "ligation" of azides and terminal alkynes. Angewandte Chemie International Edition. 41, 2596-2599 (2002). Banerjee, P. S., Ostapchuk, P., Hearing, P., Carrico, I. S. Unnatural amino acid incorporation onto adenoviral (Ad) coat proteins facilitates chemoselective modification and retargeting of Ad type 5 vectors. Journal of Virology. 85, 7546-7554 (2011). Hou, W. L., et al. Inhibition of mitochondrial complex I improves glucose metabolism independently of AMPK activation. Journal of Cell Molecular Medicine. 22, 1316-1328 (2018). Davalos, A., et al. miR-33a/b contribute to the regulation of fatty acid metabolism and insulin signaling. Proceedings of the National Academy of Science. 9232-9237 (2011). DiPersio, C. M., Jackson, D. A., Zaret, K. S. The extracellular matrix coordinately modulates liver transcription factors and hepatocyte morphology. Molecular and Cellular Biology. 11, 4405-4414 (1991). Xu, L., et al. Human hepatic stellate cell lines, LX-1 and LX-2: new tools for analysis of hepatic fibrosis. Gut. 54, 142-151 (2005). Yang, L., Li, P., Fu, S., Calay, E. S., Hotamisligil, G. S. Defective hepatic autophagy in obesity promotes ER stress and causes insulin resistance. Cell Metabolism. 11, 467-478 (2010). Heinz, S., et al. Mechanistic Investigations of the Mitochondrial Complex I Inhibitor Rotenone in the Context of Pharmacological and Safety Evaluation. Science Reports. 7, 45465 (2017).